Dubai: A fire broke out on a dhow at Deira Port on Friday evening. 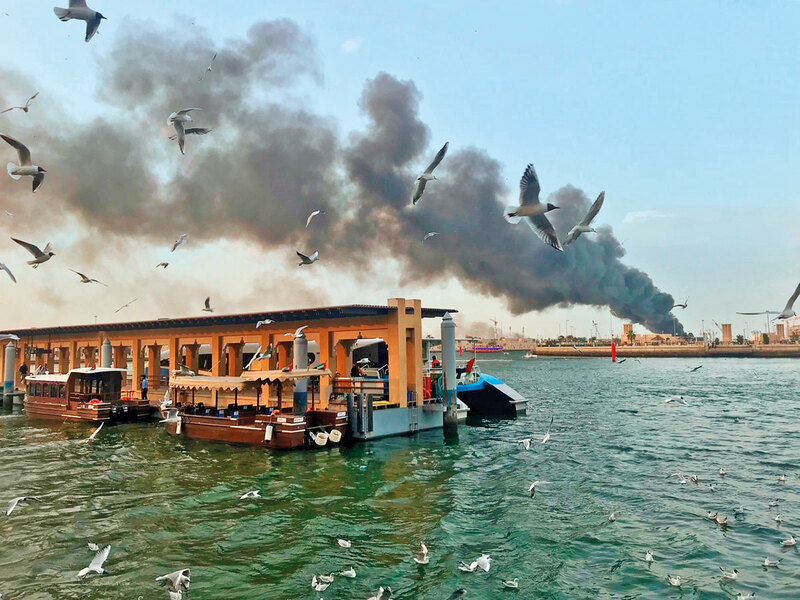 Thick black smoke was seen billowing up the Deira skyline. The incident was reported at 5.30pm, Dubai Civil Defense spokesperson said. Several Dubai residents soon started tweeting pictures and videos of the incident. Dubai Civil Defense swung into action after they were alerted of the incident at 5.30. The fire was brought under control at 6:40pm, an official said. Explosions were heard and the smoke could be seen as far as Sharjah, according to social media users who posted many tweets and videos of the incident. “The dhow was in front of Hayat Regency hotel at Dubai Creek. The dhow had tyres and flammable materials stored in it which caused the thick smoke. No injuries have been reported," spokesperson of Dubai Civil Defense said. Firefighters from Port, Karama, Hamriya and Al Ras fire stations were involved in the operation to bring the blaze under control.